A lovingly hand-crafted hut which offers you the chance to try Glamping in a beautiful part of Devon. Jacob's Hut is a Shepherd's Hut on the Devon/Cornwall border which comfortably sleeps 2 people. An ideal place to escape with breakfast available if required for an easier start to your day. From the stable door you look out to the pond and to Thrushelton Church on the opposite hill. It's even lovelier outside where you can have a picnic by the pond or relax in the summerhouse which gets the evening sun. There is a firepit in front of the summerhouse for rustling up a meal in the dutch oven or simply for toasting marshmallows. (Toasting fork supplied!) For cooler evenings you have a woodburner in the hut and lighting is by LED storm lanterns. We provide you with pots, pans, plates, cutlery, utensils, mugs, glasses, can opener & bottle opener. We also provide you with store cupboard goods that are essential to pull a good meal together, along with freshly grown herbs which are readily accessible near our cottage for you to help yourselves to. We also provide you with bedding and also towels but if you are planning a trip to the beach please bring your own beach towel. We also give you your first bag of wood, any extra are at an additional charge to be purchased onsite, please also purchase breakfast on arrival with the campsite. There is no electricity in the Shepherds Hut but electric sockets are available in the Boot Room. This is adjacent to your private shower room which is 60 paces away, plus access to power points and Wi-Fi should you need them and a hairdryer. Cooking is available at the side of Jacobs Hut and is under canvas. There is a gas barbecue that has a single boiling ring or just a few steps away the aforementioned fire pit with Dutch Oven. You have access to a fridge and deep freeze with ice cubes and wine coolers in Grumpy's Shed plus plenty of tea lights, candles and fairy lights for a romantic break. The immediate surroundings are very peaceful, with a pond and plenty of birdsong (and stars at night), whilst its situation in Devon it is perfect for branching out and visiting all manner of scenic spots. It's a great base for visiting numerous National Trust properties. Lydford Gorge is 7 miles, Castle Drogo, Cotehele, and Lanhydrock are approximately half an hours drive and there are plenty of other National Trust properties under an hours drive away. Jacob's Hut is a Shepherd's Hut on the Devon/Cornwall border which sleeps 2. An ideal place to escape with breakfast available if required for an easier start to your day. From the stable door you look out to the pond and to Thrushelton Church on the opposite hill. It's even lovelier outside where you can have a picnic by the pond or relax in the summerhouse which gets the evening sun. There is a firepit in front of the summerhouse for rustling up a meal in the dutch oven or simply for toasting marshmallows. (Toasting fork supplied!) For cooler evenings you have a wood burner in the hut and lighting is by LED storm lanterns. The hut sleeps 2 in a fitted double bed (bedding and towels supplied). A wood-burner keeps you warm (initial bag of wood supplied), there is a gas BBQ and ring hob, and candles, tea lights and solar-powered lamps provide lighting. There is no electricity in the hut. Pots, pans, plates, cutlery, crockery and utensils are all provided and there is a selection of books, board games, cards and dominoes and binoculars for bird watching. Direct access to a private, modern shower room (60 paces away, we measured it!) in an extension on the owner's cottage, where you also have access to their boot room, with electric sockets, a hairdryer and mirror, plus, in Grumpy's Shed, a fridge and deep freeze with ice cubes and wine coolers. There is also a summerhouse with a table and chairs and an outside firepit (dutch oven provided for al fresco cooking). WiFi available in the boot room only. 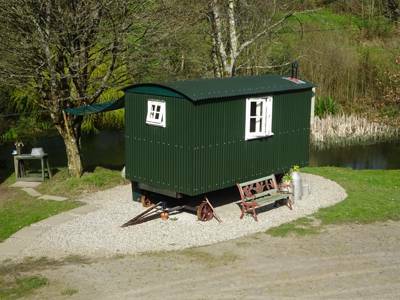 A single luxury shepherd's hut (sleeps 2). Glamping only. No tents, campervans or caravans. No dogs and no children under 10 years (due to the proximity of the pond). With Dartmoor National Park (01626 832093) nearby there is plenty to do for outdoor enthusiasts. Miles of excellent footpaths and cycle trails weave through the landscape, along with attractions like National Trust-owned Lydford Gorge (01822 820441) 7 miles away, Finch Foundry (01837 840046) and Becky Falls Woodland Park (01647 221259). Morwellham Quay (01822 832766) and Tuckers Maltings (01626 334002) offer a little local history, as does Dingles Steam Village (01566 783425), while the historic towns of Tavistock (01822 612320) and Totnes (01803 863168) are further afield but well worth a visit. Castle Drogo (01647 433306) – another National Trust property – and Okehampton Castle (0870 333 1181) also vie for your attention. It's 45 minutes by car to the beaches of Bude, Boscaste, whilst Croyde and North Devon is a testing 90 minute drive. The city of Exeter is a similar distance. Optional breakfasts are available, delivered fresh to your hut door. You can add them as an extra when you book. It's £6 per head for a continental breakfast and £8 per head for a full English. For pubs, Lifton is 4 miles away, where you'll find The Fox and Grapes (01566 784217), The Lifton Hall Hotel (01566 784863) and The Arundell Arms (01566 784666) for hearty dinners and there's also an excellent farm shop (01566 784605) with an adjoining café during the day. It's 3 miles to Bratton Clovelly, where The Clovelly Inn (01837 871447) is a top choice. All year (except over the Christmas period). From Exeter, take the A30 towards Okehampton. Go past the Okehampton turn off and take the next one signposted Sourton Down/Sourton Cross, Tavistock, Bideford. Go down the slip road in the right hand lane and at the T junction follow signs for Bridestowe, Lewdown and Lifton. Follow this road until you enter Lewdown. Go past the Post Office and shop on your left, and the war memorial, and as you leave the 40mph zone there is a right hand turn for Thrushelton. Follow signs into Thrushelton and as you come down the hill, Thrushelball is the first driveway on your left. The nearest railway station is some 35 miles away in Exeter (0845 748 4950), though the nearest bus stop is better at 1 mile from the site. Your own transport is highly recommended however.